As a Student Union Officer I have seen just how impactful the buses in York can be on our community and our students. I can say without a doubt that one of the most important things for all of our students, regardless of age, background, or ability is access to public transport. However, this is an issue that impacts every resident of our community be they a student, a pensioner, a business owner, civil servant, a parent, or even a child. York needs its public transport to be affordable, reliable, and accessible to all of its residents. 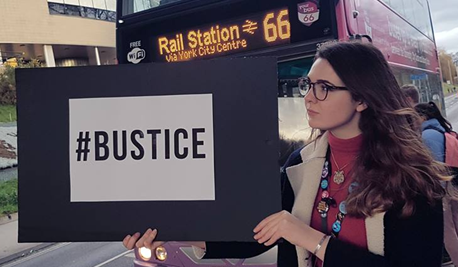 Despite writing this as a student representative, it is quite clear that the challenge is not just a student problem and I must say I believe it is also not just a bus problem. What is abundantly clear is that York needs a much better public transport system and if we can create that then all of York will benefit. FirstBus tells us on their website that they ‘provide solutions for an increasingly congested world... keeping people moving and communities prospering’. Our students do not accept that they are succeeding in either part of this objective. In discussions with First, we can see some incremental changes in the service but the simple reality remains that the prices are increasing, punctuality and frequency dropping, and the routes shifting. If this continues to happen, bus usage will fall and the city and ALL its residents will lose out, and sadly, poor public transport affects the most vulnerable first. It is the people who can't afford other transport who will suffer most; the unemployed person trying to get to their job interview; the elderly person who needs to get to the hospital; the child heading to school; the student who needs to get to campus for their seminar. Simply put, buses provide mobility. People need the buses to provide access to education, employment, healthcare and recreational opportunities. The 66 route for example connects all of these, from sports facilities, to a medical centre, to the city centre and the University. Public transport also provides a service to those with accessibility requirements – our ever increasing elderly population, those with disabilities who can no longer drive, those who haven’t passed driving tests, or those who simply choose not to own or travel by car. After all, we must not forget that public transport is also a more environmentally friendly option for travel. York Council has made consistent pledges to care for the city and it’s residents. In 2010, Public Health England attributed 82 deaths in York to our air pollution, and as part of the city wide effort to improve our air, Jorair are actively encouraging the “uptake of…public transport in the city”. York even has an ‘Air Quality Action Plan’ , yet congestion and pollution from vehicles continues to mount. On itravelyork, it states that “just one person opting to take the bus rather than drive to work every day can reduce their carbon footprint by up to 3.8 tonnes per year”. Are we as a city not committed to environmental sustainability? Buses reduce road congestion, are less air polluting, average less fuel consumption than alternatives and can enhance neighbourhood safety and security. Without effective public transport more people will use private cars which clog up the roads, take up street space and parking and in doing so makes streets more dangerous, and cost us thousands when renovating our infrastructure. Itravelyork tells us that ‘one bus can do the job of 40 cars and significantly reduce the demand for road improvements’. We cannot afford to keep maintaining infrastructures, which, with adequate public transport, would not be being damaged to this extent in the first place. Finally, our economy. We all want York to thrive, and a successful and thriving economy requires a high quality bus network that can bring the best employees in from a wider geographical space. A public transport system that can bring customers in from a wider region. A public transport system that can enable a growing population of students who live, work and socialise off-campus and across the wider region. Industry and business are also set to lose out if the council do not engage with us on this issue. The City of York needs an affordable, reliable, environmentally sustainable bus network that can transport people effectively and in doing so improve social mobility and reduce environmental damage. This is essential for us to examine when looking at the future of public transport in York. The problems with public transportation impact the entire City, and there is not necessarily an easy fix. I want to bring together a wide range of people to explore possible solutions that will benefit us all. I am well aware that this is not a problem that the Student’s Unions can solve themselves and I certainly cannot identify what the real long term solutions look like alone. That is why we are calling on people from across York to join us in pushing the public transport agenda by adding your name to our petition. We are most likely to find the real solutions by starting a conversation that brings together a wide range of constituents from students to professionals, from the retired to the youth with academics, councillors and Town planners all thrown in the mix. With that in mind I have written an open letter to Councillor Peter Dew, the Executive Member for Transport and Planning in York to demand that he holds a public inquiry to understand how our transport system became this bad, and evaluate the needs of the whole of York for an effective public transport network that supports the needs of the people who live, work and study in York as well as the City itself. First Bus promise to provide solutions...so help us get them!